Clinic Synopsis: In the last several years, flipping the classroom has become a buzzword of sorts in the educational community. The purpose of this clinic is to demystify the term, and to describe its usefulness in the instrumental ensemble rehearsal. All conclusions stem from a rehearsal experiment with the Cornell Wind Symphony, in which two pieces performed in the fall semester were contextualized in flipped rehearsal modules: Percy Grainger's "Colonial Song," and the second movement of Vincent Persichetti's Sixth Symphony. In addition to student-centered rehearsals, the experiment included the dissemination of pre-class learning materials through Panopto lecture videos, an ensemble rehearsal blog, and recordings and scores posted on Blackboard. 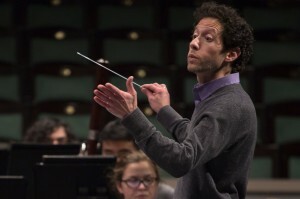 Clinician Biographical Information James Spinazzola is interim wind ensemble director at Cornell University, where he conducts the Wind Symphony and serves as faculty adviser to the student organization CU Winds. Before coming to Cornell, James was a tenured faculty member at the University of Indianapolis, where he served as associate professor of music and director of instrumental activities. Additional posts have included those as assistant professor of music at Tennessee Tech University, and conducting and teaching positions with the New World Youth Philharmonic, the Indianapolis Youth Wind Ensemble, and the Tennessee Governor's School for the Arts. As a guest conductor, he has worked with numerous bands, orchestras, and jazz ensembles throughout the world; recent engagements included those with the Minnesota Honor Band, Georgia Honor Jazz Ensemble, University of Montana Orchestra, Duquesne University Wind Ensemble, and American Schools in Shanghai. He also lectures frequently on a variety of topics, most recently on jazz arranging and composing at Shanghai Normal University. As a saxophonist, he has recorded an album of concertos on the Mark Custom label, and he continues to perform in both jazz and classical venues. His work as an arranger and author is published by Boosey & Hawkes, GIA, Scarecrow Press, and Subito Music; and he has been privileged to premiere his transcriptions of music by John Adams, Steven Bryant, Tania León, Wynton Marsalis, and Roberto Sierra.